Mary is interested in understanding the assembly, structure and regulatory mechanisms of macromolecular assemblies involved in biological networks. Her long-term research interest is to bring together different areas of research to better understand the molecular mechanisms of regulatory assemblies carried out at the interface of RNA and disease-related proteins to shed light on their functioning towards disease progression using molecular and structural means. 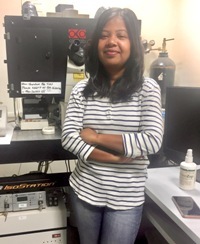 In order to achieve her goal, she will combine and correlate results obtained from an array of biophysical techniques including isothermal titration calorimetry, spectroscopy, surface Plasmon resonance, kinetics and other molecular biology tools. Substrate-Induced Facilitated Dissociation of the CompetitiveInhibitor from the Active Site of O-Acetyl Serine Sulfhydrylase Reveals aCompetitive-Allostery Mechanism. Singh AK, Ekka MK, Kaushik A, Pandya V, Singh RP, Banerjee S, Mittal M, Singh V, Kumaran S. Biochemistry. 2017 Sep 19;56(37):5011-5025. doi:10.1021/acs.biochem.7b00500. Two Distinct Assembly States of the Cysteine Regulatory Complex of Salmonella typhimurium Are Regulated by Enzyme-SubstrateCognate Pairs. Kaushik A, Ekka MK, Kumaran S. Biochemistry. 2017 May 9;56(18):2385-2399. doi:10.1021/acs.biochem.6b01204. Influence of Ionic Liquids on Thermodynamics of Small Molecule-DNA Interaction: The Binding of Ethidium Bromide to Calf ThymusDNA. Mishra A, Ekka MK, Maiti S. J Phys Chem B. 2016 Mar 17;120(10):2691-700. doi: 10.1021/acs.jpcb.5b11823. Second monomer binding is the rate-limiting step in the formation of the dimeric PhoP-DNA complex. Singh V, Ekka MK, Kumaran S.
Biochemistry. 2012 Feb21;51(7):1346-56. doi: 10.1021/bi201257d. Teratogenic, Cardiotoxic and Hepatotoxic Properties of Related Ionic Liquids Reveal the Biological Importance of Anionic Components. Aditi Pandey, Mary K. Ekka, Shashi Ranjan, Souvik Maiti, Chetana Sachidanandan. RSC Advances, (2017), 7, 22927-22935.